CLUB SODA - CVSC SIGN PAINTING! 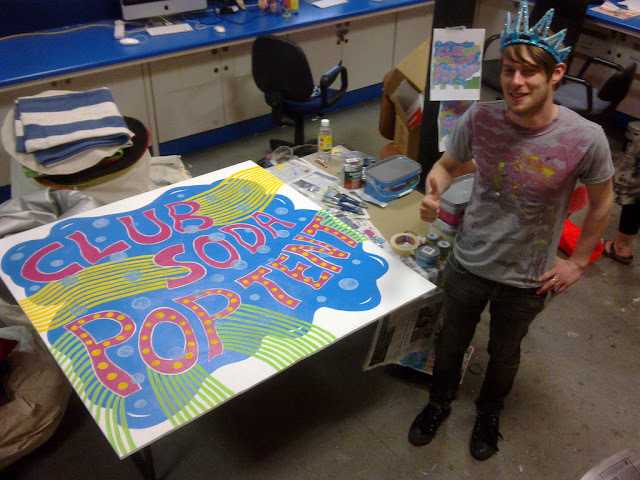 Just tonight finished hand painting this sign I designed for CLUB SODAs pop tent at Croydon summer festival. Took me two days to paint it and I'm just gonna say it, I'm well pleased with myself! 4x4 foot. Croydon summer festival is happening this Saturday 31st July at Lloyd Park in Croydon, come!! I'll be there doing live TAGTOOL doodles in the pop tent which will be projected onto the stage throughout the day. It's gonna be fun! CLUB SODA events are produced and run by people with learning disabilities, do click the link to their website to find out more, they are a great bunch of people doing awesome stuff. They are based at the CROYDON CLOCKTOWER who as it turns out are doing some great stuff generally, check it out, go there!